Londoners are very fortunate in having a large number of green open spaces, where they can escape the hustle and bustle of city life. Many of these were the former grounds of large houses or royal parks, whilst others were specially created as London expanded. The River Thames also offers Londoners a variety of day trips. Further outdoor attractions include London's public sculpture and historic sites like Highgate Cemetery. All these open air destinations have been promoted by London Transport posters. London's gardens have been extremely well promoted on posters for the Underground. The subject lends itself perfectly to bright, vibrant and eye-catching design. 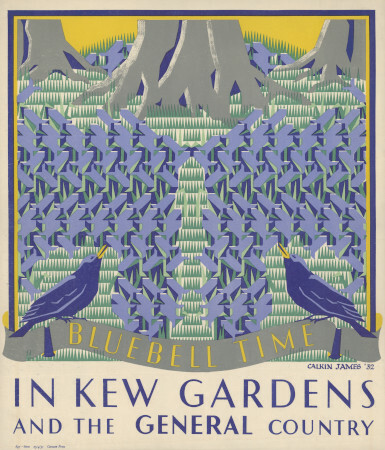 Many posters simply publicised the seasonal bloom, particularly bluebells, crocuses and daffodils. Others advertised travel to specific locations, such as Kensington Gardens. The world famous botanical collection at Kew Gardens has appeared on more Underground posters than almost any other subject. The gardens at Hampton Court were also promoted as an excursion from London by tram. Panel poster : Panel posters were produced for display in Underground car interiors, as well as on the inside and outside of buses and trams. Because they did not have to fit a standard frame or wall space, they are smaller than other poster formats and vary slightly in size.